Something stirs from beneath the seas this week as the Idoneth Deepkin march to war with their first wave of releases! – A showcase of beautifully-painted Citadel miniatures, with an example army and comprehensive painting advice from the experts, including stage by stage examples of painting skin, blades, sea detritus and creatures, scales, and helmet crests. Along with this are colour schemes and guides to painting 6 named Enclaves: Ionrach, Dhom-Hain, Fuethán, Mor’phann, Nautilar, and Briomdar. – Pitched Battle Profiles for all units featured in this Battletome, including unit sizes, points values and battlefield roles. This is a set of 20 6-sided 16mm dice in a translucent blue representing the vastness and depth of the ocean from which the Idoneth Deepkin hail. Each features an Idoneth icon in place of the 6 and a skull in place of the 1, with waves on the faces in place of pips. This pack of 14 large-format cards contains each of the unit Warscrolls from Battletome: Idoneth Deepkin, printed on individual cards for handy reference in your battles, along with 2 sheets of gaming tokens covering spells and artefacts specific to this faction, along with the Tides of Death Battle Traits and the Enclave-specific Command Traits. But it’s not just rules out today, we also have some fantastic citadel miniatures up for order! Idolised echoes of a bygone era, the Eidolons of Mathlann are summoned to life in times of dire need. These are no divine avatars, however, but collective manifestations of the ancestral souls of the Idoneth Deepkin, spirits of vengeance wrapped in the image of a lost aelven god. Eidolons are formed from the combined energies of the souls that can be roused from an enclave’s chorrileum – a living coral reef, storing the essence of expired Idoneth. When an Eidolon is summoned in the aspect of the sea, it can summon cloying sea mists, release golden energies to heal the Idoneth’s wounded and lull the most bloodthirsty enemies into a mystic slumber from which they never wake. This multi-part plastic kit contains the components necessary to assemble an Eidolon of Mathlann, in his form as an Aspect of the Sea. 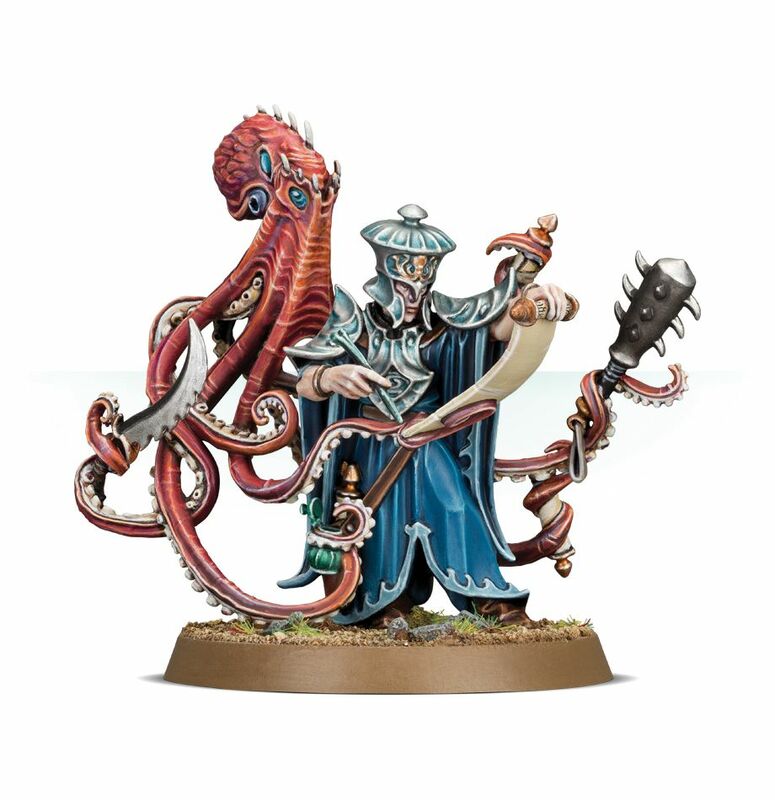 Towering over the other Idoneth, he comes armed with a psi-trident – a massive 3-pronged spear in his left hand, which can summon blasts of abyssal energy; and a deep-sea sceptre wrought with jewels and used to club anything that gets too close. His armour resembles a set of scales, topped of by an open-face helm and enormous fanned crest. The most striking feature of both Eidolon models, either of which can be built from this kit is definitely the cloak – representing the unimaginable power of the seas, it is styled as a cascading torrent of ocean water. There are plenty of detailed basing options included, with corals, sea creatures and other detritus from beneath the waves included – you’ll have a lot of spares left over to decorate other Idoneth miniatures. As well as this, an ethereal Stormshoal fights alongside the Eidolonn. This kit comes as 51 components, and is supplied with a Citadel 100mm Round base. The kit can alternately be used to assemble the Eidolon of Mathlann – Aspect of the Storm. Like all aelves, Namarti Thralls possess a physical grace that to other races appears supernatural. The Thralls march to war for the Idoneth as the main body of their infantry, and it is their task to engage and hold the enemy in place. In battle the Namarti fight with an array of weapons known as lanmari – two-handed swords, great scythe-axes or pole-axes of intricate design. The weight and reach of such weapons are useful when driving off the enormous sea creatures that bedevil the Idoneth enclaves, while their broad blades are suited to scything through the teeming swarms of predatory fish that seek to prey upon the aelves. This multi-part plastic kit contains the components necessary to assemble 10 Namarti Thralls. Clad in less-ornate armour than their commanders and superiors, as befits their withering souls and disposable nature, they still cut impressive figures – each is powerful and muscular. There are 11 heads in the kit, which can be placed on whichever models you wish; each is hairless and blind, with blank, empty sockets where eyes should be. 10 elaborate neck crests are included, which curve upward and behind their heads, giving the impression of spiked horns. There’s plenty of choice in their weapons – each wields a two-handed lanmari, as follows: 4 can take a choice of glaive or sword, 3 have a choice of axe or sword, 2 carry swords and 1 carries an axe. There is an option for an icon bearer – they have a specific head, and a large mathlann slave rune which forms part of their neck crest. As an added bit of detail the kit comes with 6 pieces of scenery and fish for the bases, which can be added to any model you like.. This kit comes as 90 components, and is supplied with 10 Citadel 32mm Round bases. Gifted with the spirit-sight and keen analytical minds, the Soul Wardens keep a tally of interred souls, tending to them and calculating how many are needed for certain tasks. Ordinarily they do not accompany the phalanxes to war, but there is one exception – Lotann of the Ionrach. Such is Lotann’s obsessive commitment to his duty, his willpower stains the ethersea, a presence that inspires the Idoneth to fight with heightened zeal. His highly intelligent multi-limbed Ochtar familiar aids him in his task of scribing his catalogue of souls, by keeping aggressors at bay with a serrated blade and spiked cudgel. This multi-part plastic kit contains the components necessary to assemble Lotann, Warden of the Soul Ledgers. Hardly concerned with the violence and melee going on all around him, Lotann is utterly absorbed in the Catalogue of Souls – an enormous parchment scroll clutched in his left hand, on which he tallies the Idoneth’s captured souls. He uses a bone quill to do so – on occasion, he’ll use this to stab an encroaching enemy, but for the most part his defense is left to his Ochtar familiar. This is a large, octopus-like creature which looms over Lotann’s right shoulder, brandishing a cudgel, a serrated blade and even thoughtfully carrying a spare scroll, should the tally of souls grow too large to count. Lotan, Warden of the Soul Ledgers comes as 8 components, and is supplied with a Citadel 40mm Round base. Alongside this we also get a new scenery piece that offers powerful buffs to a Deepkin army! When the Idoneth Deepkin go to war, they bring their supernatural sea with them. Ethereal creatures, fish and corals flicker into existence, while features of the seabed manifest themselves eerily on the battlefield. Barnacle-encrusted shipwrecks become havens for aquatic creatures, and shoals of etherfish dart out to protect the Idoneth Deepkin or assail any foes who draw near. 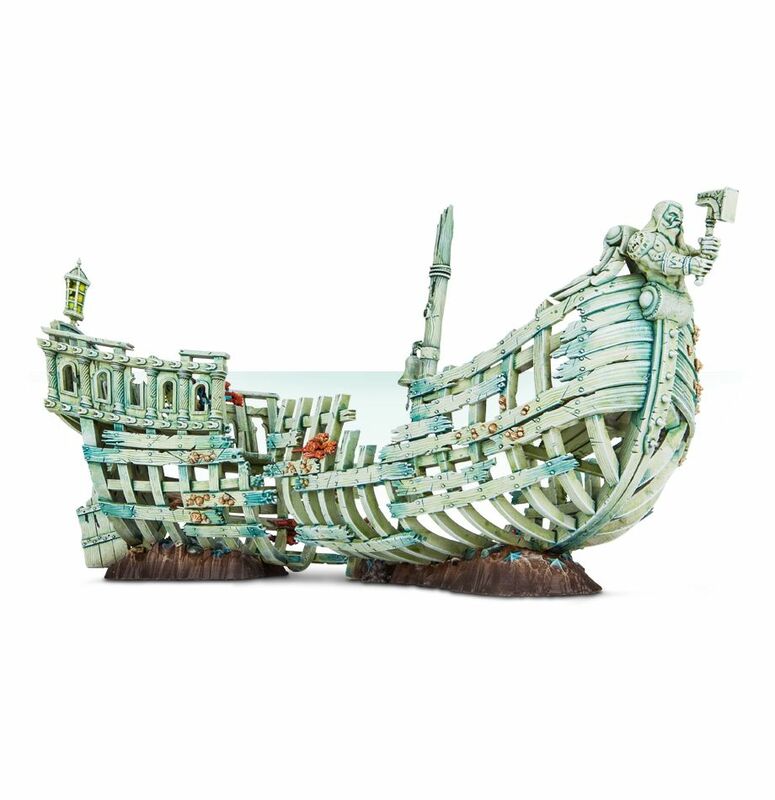 This multi-part plastic kit contains the components necessary to assemble a Gloomtide Shipwreck. This is an Etheric Vortex scenery piece, which models with the Idoneth Deepkin allegiance have access to. The Shipwreck itself is a sea-dessicated hull, the skeleton of some long-forgotten vessel now home to barnacles, coral and creatures sympathetic to the Idoneth. The model is in 2 pieces, which can be placed separately on the battlefield, or together to form one wrecked hull – each section is encrusted with barnacles, littered with bones and trinkets, and feature ship details such as a broken sextant, a ruined rudder, a lantern and a ship’s bell. Alluding to the wreck’s former life, there are plenty of Sigmarite details, with a figurehead holding a hammer, a twin-tailed comet on the mast and a plaque at the rear. Also included are 6 shoals of sea creatures – these can be added to the wreck as you please, though make excellent additions to the base of any Idoneth Deepkin miniature. This is only the surface of this release though, with lots more to come in the next few weeks – so stay tuned!! Check out all the Pre Orders over on Games Workshop from 10am each Saturday! Mumak War Leader- New Lord of the Rings kit from Forge World today! Next Week’s Pre Orders – Deepkin Wave 2!